KAIROS is a two-day freedom event designed to help you connect with the voice of God. Kairos is a Greek word that means "opportune time," and that is what we want KAIROS to be for you - an opportune time to hear from God about who He is and who you are in Him. 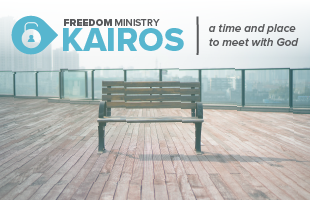 KAIROS mixes profound teaching and personal ministry to help you hear God in new ways, learn how to let go of things you know you need to release, and receive true freedom. KAIROS is a large gathering, but is designed to give you private moments with the Lord. You will not be expected to pray for or share with others. KAIROS is free, but there is an investment of time required. Be sure to organize work, childcare, and your schedule accordingly. **We ask that you complete the five freedom basics classes before coming to KAIROS. You can register for these classes if you haven't yet taken them, or listen to them online or on our app (Christ People ICT). Light snacks are provided.Childcare available for 6 months - 5 years old. Childcare is limited, so register today! Registration is required.